Shortly after the end of the First World War tests were started at Daimler with the objective to increase the performance of automobile engines through the use of a Supercharger. Already in 1916 people in Untertürkheim had started to develop and test aircraft engines being equipped with a Supercharger - at that time this was still called a blower. This development was initiated by Paul Daimler, the Technical Director of the Daimler-Motoren-Gesellschaft. In numerous tests completely different compressor-concepts were tried as a usable solution with a Roots blower was not found until 1918. After the restrictions of the treaty of Versailles limiting the production of aircraft engines to light-weight engines for sports aircraft, it was only logical to use the findings of the development of Supercharger also in the field of vehicle engines. The first tests to equip slide-valve controlled Knight engines with a Roots compressor weren't successful due to thermal problems that could not be solved so that people again turned to conventional valve-controlled engines. The Supercharger was successfully used with the first two engines designed after the war - comparatively small 4-cylinder aggregates with vertical-shaft drive, valves arranged in V-position and individual cylinders made of steel whose conception in turn had been inspired by the construction of aircraft engines. 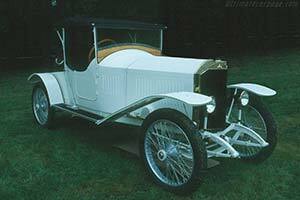 This resulted in two supercharged models being launched at the Berlin Automobile Exhibition in September 1921, the 2.6 litre engined 10/40 and the 1.6 litre 6/25. The figures in the name showed the taxable hp and the real hp without the Supercharger engaged, later on a third figure was added to the name which showed the hp with the Supercharger engaged. These were the first models with engageable Roots-Type Superchargers and it went on to be used on both Mercedes and Mercedes-Benz road and race cars in the two decades to come with great commercial and racing successes as a direct result.